Once the very definition of a cheap building, sheds are now regarded as quality buildings, featuring shingled roofs, clapboard siding and lofts. If you're just looking to keep equipment and tools out of the weather, there are much less expensive ways to go. Of course, if you are sacrificing aesthetics for lower cost, it may be wise to put your cheap shed where the neighbors cannot see it. The simplest and cheapest structures of all are lean-tos, particularly those built against existing exterior walls. Lean-tos can be as simple as a line of planks nailed to a wood header that is then nailed to the exterior wall; the bottom ends of the planks rest on the ground. If the structure needs to be very waterproof, you might want to add some shingles or rolled roofing over the planks. Lean-tos require no internal supports and can be built with nothing but a hammer and a saw. However, their design provides relatively lower headroom, so lean-tos are best for storing equipment and supplies that don't take up much vertical space. There are many kits available online and in hardware stores that consist of prefabricated metal or plastic frames, topped or surrounded by vinyl, Mylar or canvas. These can be quite inexpensive; in addition, some of them feature pop-up frames, so they can be constructed in under an hour. They come in all sizes, from lawnmower size all the way up to portable garages that provide storage for cars and boats. You can channel your inner pioneer and build a shed from logs. Log frames can be nailed or lashed together, possibly even using standing trees as corner posts. Smaller logs are then nailed or lashed on top of this frame. If you've got access to woodland, a log-framed shed can be built for practically nothing, and the result will certainly look at home in the environment. It's hard to build log-framed structures to stay absolutely waterproof unless you add some plastic sheeting over the top. PVC pipe is light, durable and relatively cheap; using T and Y connectors, you can construct a wide variety of frames to meet your precise needs. Use of PVC cement is important for keeping the frame together. The frame can be covered with plastic tarps; if you choose transparent or translucent plastic sheeting, your shed can double as a greenhouse. 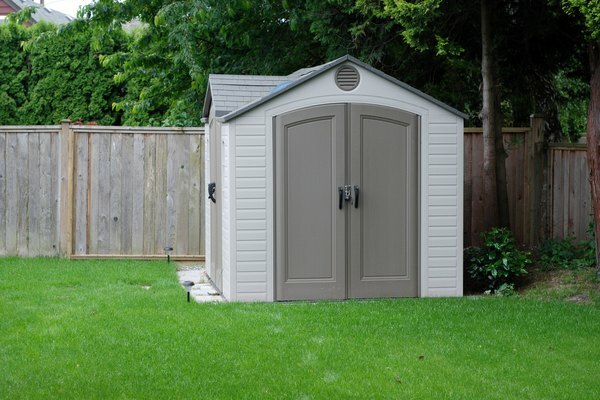 Portable Building Store: Looking for a Cheap Alternative to a Garden Shed? Get a Portable Shelter! 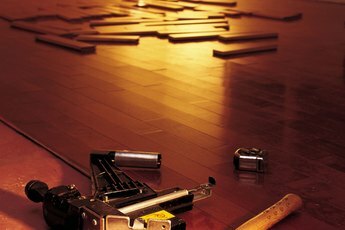 How Do I Reuse Hardwood Flooring?